NOTICE: Activation key must be used on a valid Steam account. 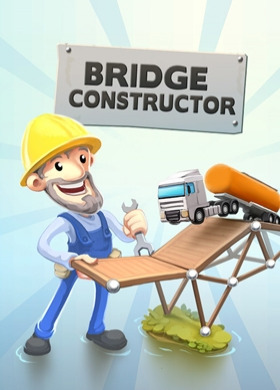 Requires internet connection.ABOUT THE GAMEBecome an appraised bridge engineer and architect in Bridge Constructor. Create and design your own constructions and watch the cars and trucks pass over them - or see them fall and crash while your inferior creations collapse due to weight and the laws of physics! Progress through numerous lev… els and build bridges over deep valleys, canals, or rivers. Stress tests reveal whether the bridge you build can withstand the daily stress of continual use from cars and trucks. Choose between a range of materials for each individual bridge, such as wood, steel, cables, or concrete pillars. Use the appropriate materials and stay within budget to build the perfect bridge. The choice of materials enables you to build each bridge in almost infinite variety – your budget is the only limit. So get on the drawing board and set your imagination and creativity free! The Steam version also includes SlopeMania, a fully sized Add-On to the original game, bringing more levels, features, a new setting and much more.KEY FEATURES 64 Levels 6 Settings: City, Canyon, Beach, Mountains, Hills, Grotto Option to build sloping roads Map with all unlocked worlds/levels 4 different building materials: Wood, Steel, Cables, Concrete pillars Color coded load indicator for different building materials Three different load bearing levels: Car, Truck and Tank Truck High score per level Steam achievements & Leaderboards SYSTEM REQUIREMENTS PC OS: Windows XP, Vista, 7, 8 Processor: 1,8 GHz Memory: 1 GB RAM Graphics: DirectX9 compatible with Shader Model 2.0 Mac OS: Mac OS 10.6 Processor: 1,8 GHz Memory: 1 GB RAM Graphics: Graphics card with Shader Model 2.0 Linux OS: Ubuntu 12.04 or equivalent (32bit or 64bit with ia32-libs installed) Processor: 1,8 GHz Memory: 1 GB RAM Graphics: DirectX9 compatible with Shader Model 2.0 Additional Notes: Linux 64bit users need to have ia32-libs package installed (sudo apt get install ia32-libs) (c) 2013 Headup Games GmbH & Co. KG, all rights reserved, www.headupgames.com, ClockStone and its logos are trademarks of ClockStone Software GmbH.